Our brand new Bar Bracelet allows you to glance down at your wrist to catch sight of your mantra through the day. 'Anything is possible, if you believe' is an inspiring mantra if you are facing exams, or a business or personal challenge, or setting out on something new. We love the uplifting message of this mantra. Give someone you love confidence and self-belief, by reminding them that so much is possible in life, if only you believe it will happen, and you believe in your own abilities. 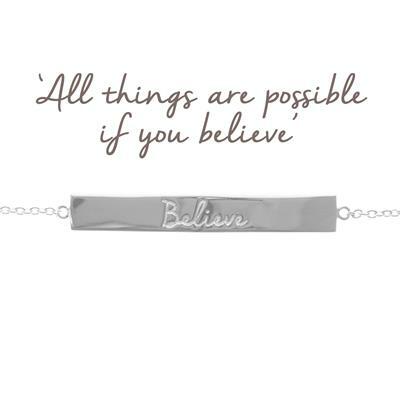 The horizontal bar has the word 'believe' inscribed, and the full mantra is written on a beautiful card to keep, with an inspiring image on the front, and space on the back for your personal message.